Bearing in mind the current brutal treatment of Irish political prisoners, in the wake of the Peace Process and hunger strikes, Gerry Adams' party's apparent detachment or covert involvement with due process, the critical question for the Irish Republican Movement today, must now surely be the following. Would a Sinn Fein Government led by Gerry Adams in the Free State, rely on special courts, military tribunals and draconian legislation like De Valera (Sinn Fein/ Fianna Fail) previously did, in attempts once again to crush Irish Republicans. and more worryingly a coalition with Fiann Fail deliver even greater repression than the current Zionist Blueshirt axis. In 1936, De Valera’s Fianna Fáil government introduced special courts to imprison republicans and three years later, in August 1939, during the IRA’s English Campaign, it also established special military tribunals which were empowered to return only one the death sentence, from which there was no appeal. During the early 1940s, hundreds of republicans were interned by De Valera and sentenced to long periods of imprisonment by special courts. Six IRA Volunteers, Paddy McGrath, Thomas Harte, Richie Goss, George Plant, Maurice O’Neill and Charlie Kerins – were tried by military tribunals, found guilty and executed. The same De Valera Government also allowed another three Republicans, Jack McNeela, Tony D'Arcy and Sean McCaughey die on Hunger-Strike. So the question now is; Would Gerry Adams bearing in mind his current record of collusion, interning innocent people like Martin Corey be another Eamon De Valera disaster? Are Provisional Sinn fein secretly enabling this odious activity with their President's private religious blessing? At the general election of 1957, De Valera, then in his seventy-fifth year, won an absolute majority of nine seats, the greatest number he had ever secured. This was the beginning of another sixteen-year period in office for Fianna Fáil. A new economic policy emerged with the First Programme for Economic Expansion. In July 1957, again in response to the Border Campaign (IRA), Part II of the Offences Against the State Act was re-activated and he ordered the internment once again without trial of Irish republican suspects, an action which De Valers claimed, did much to end the IRA's campaign. But it didn't did it ? Neither did internment in the early '70s with Adams himself interned along with Martin Corey. 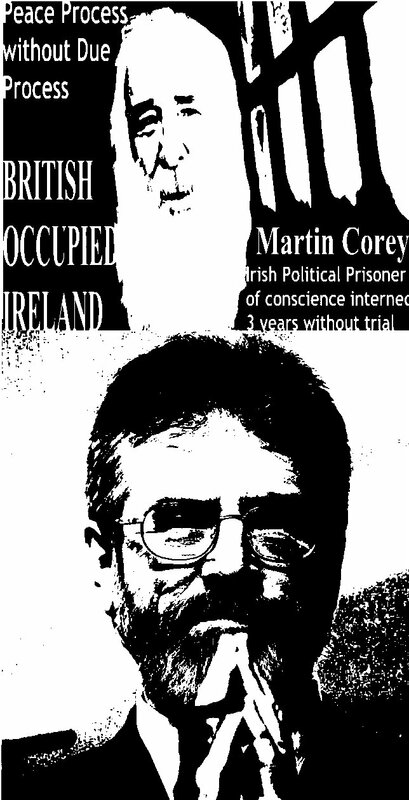 The central question currently with regard to the political prisoner of conscience Martin Corey Corey is whether Gerry Adams is going down the De Valera route or does he or his party, actually have anything progressive to offer the extremely dysfunctional island of Ireland? The omen are not good without any actual current activity other than a few prayers by Adams on the release of Marian Price. Like the banketer farce, words are simply not good enough at this stage, action is now required. Provisional Sinn Fein have been given the same mandate that the SDLP were given 40 years ago when they withdrew from Stormont and a nominally republican Irish party, has no business there while administering internment. There is no grey area with regard to this, they cannot run with the hare and hunt with the British hounds on this issue any longer. Hiding in prayer, while ignoring Martin Corey's reality is not good enough at this stage.